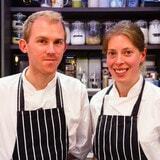 The chefs Louisa and Rupert were fantastic at working with me to create a menu to suit the occasion. On the evening the chefs were professional and the food was amazing rivalling meals we have eaten in various Micheillin Star establishments around the country , the fillet of beef is one the best meat course we have eaten. I can not fault the food it was amazing and exceeded our expectations making our event as special as we hoped it would be. The kitchen was left immaculately clean afterwards, a really enjoyable evening we will definitely be recommending and certainly looking for the next opportunity to have Louisa and Rupert cook for us again. If you are thinking of having an event don't think to hard just book it you will certainly not be disappointed that is guaranteed!! We just had a fabulous dinner cooked by chef Louisa. Some of the food was so fresh it was picked from her own garden that day! Lots of flavour and she could even cater to my dietary requirement of gluten free vegetarian Italian food. Highly recommended - we can't wait to have her come back. Thanks Louisa! Excellent meal and beautifully presented. Particularly enjoyed the scallop dish and was interesting to hear scallops had been caught that day in Skye. The potatos in the main dish were very interesting and lovely. Fabulous meal, beautiful presentation, great service. Very enjoyable evening. We would struggle to pick just one as it changes all the time, but crab and scallop lasagne with leeks and a bisque sauce has always had a spot in our top three. We do love a potato, there is so much versatility in what you can do with them. The first arrival of rhubarb in the kitchen is always yearly highlight, slightly trumping the first Jersey royals, wild garlic and chanterelles. We make a lot of bread; the sourdough starter makes a very good travelling companion, and there's nothing to beat freshly baked bread. After years in restaurant kitchens it is wonderful to be cooking our own dishes and be working in this amazing part of the world. If you believe this content violates or infringes your rights, Rupert & Louisa may not know. You could solve this problem by contacting him.